A club to avoid the restricted video distribution law in Slovenia. Non-stop video club provided films which were not available in any other video stores, because a restrictive video distribution law that allowed only films which have been subtitled in the Slovenian language, To borrow the tapes, people had to be members of the club. Membership and rent were free of charge, so this allowed anyone to become a member of the club while at the same time, it legitimised its function. Ultimately its goal was to give access to international films to a Slovenian audience, and to foster a new relationship between art institution and its audience. 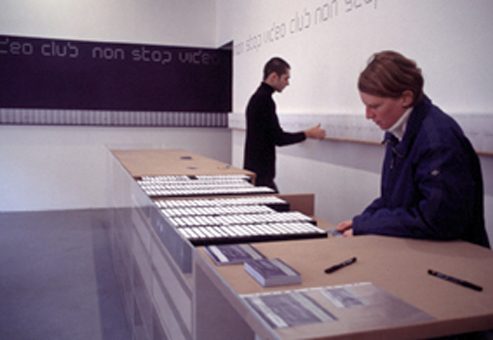 It offers a free selection of videotapes composed by Art videos from the collection of the Moderna Galerija and Art videos by international artists.